Born at Oothcaloga in the Cherokee Nation, Georgia (near present day Rome, Georgia) on December 12, 1806, Stand Watie's Cherokee name was De-ga-ta-ga, or "he stands." He also was known as Isaac S. Watie. He attended Moravian Mission School at Springplace Georgia, and served as a clerk of the Cherokee Supreme Court and Speaker of the Cherokee National Council prior to removal. (Right) Stand Watie (December 12, 1806 – September 9, 1871). As a member of the Ridge-Watie-boundinot faction of the Cherokee Nation, Watie supported removal to the Cherokee Nation, West, and signed the Treaty of New Echota in 1835, in defiance of Principal Chief John Ross and the majority of the Cherokees (see Cherokee Trail of Tears: A History). Watie moved to the Cherokee Nation, West (present-day Oklahoma), in 1837 and settled at Honey Creek. 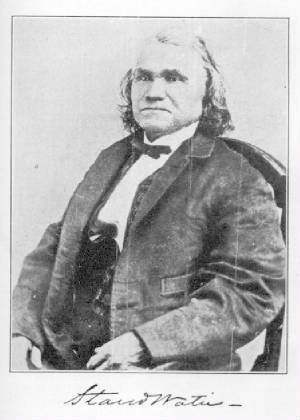 Following the murders of his uncle Major Ridge, cousin John Ridge, and brother Elias Boundinot (Buck Watie) in 1839, and his brother Thomas Watie in 1845, Stand Watie assumed the leadership of the Ridge-Watie-Boundinot faction and was involved in a long-running blood feud with the followers of John Ross. He also was a leader of the Knights of the Golden Circle, which bitterly opposed abolitionism. At the outbreak of the Civil War, Watie quickly joined the Southern cause. He was commissioned a colonel on July 12, 1861, and raised a regiment of Cherokees for service with the Confederate army. Later, when Chief John Ross signed an alliance with the South, Watie's men were organized as the Cherokee Regiment of Mounted Rifles. After Ross fled Indian Territory, Watie was elected principal chief of the Confederate Cherokees in August 1862. A portion of Watie's command saw action at Oak Hills (August 10, 1861) in a battle that assured the South's hold on Indian Territory and made Watie a Confederate military hero. Afterward, Watie helped drive the pro-Northern Indians out of Indian Territory, and following the Battle of Chustenahlah (December 26, 1861) he commanded the pursuit of the fleeing Federals, led by Opothleyahola, and drove them into exile in Kansas. Although Watie's men were exempt from service outside Indian Territory, he led his troops into Arkansas in the spring of 1861 to stem a Federal invasion of the region. Joining with Maj. Gen. Earl Van Dorn's command, Watie took part in the Battle of Elkhorn Tavern (March 5-6, 1861). On the first day of fighting, the Southern Cherokees, which were on the left flank of the Confederate line, captured a battery of Union artillery before being forced to abandon it. Following the Federal victory, Watie's command screened the southern withdrawal. Watie, or troops in his command, participated in eighteen battles and major skirmishes with Federal troop during the Civil War, including Cowskin Prairie (April 1862), Old Fort Wayne (October 1862), Webber's Falls (April 1863), Fort Gibson (May 1863), Cabin Creek (July 1863), and Gunter's Prairie (August 1864). In addition, his men were engaged in a multitude of smaller skirmishes and meeting engagements in Indian Territory and neighboring states. Because of his wide-ranging raids behind Union lines, Watie tied down thousands of Federal troops that were badly needed in the East. Watie's two greatest victories were the capture of the federal steam boat J.R. Williams on June 15, 1864, and the seizure of $1.5 million worth of supplies in a federal wagon supply train a the Second battle of Cabin Creek on September 19, 1864. Watie was promoted to brigadier general on May 6, 1864, and given command of the first Indian Brigade. He was the only Indian to achieve the rank of general in the Civil War. Watie surrendered on June 23, 1865, the last Confederate general to lay down his arms. 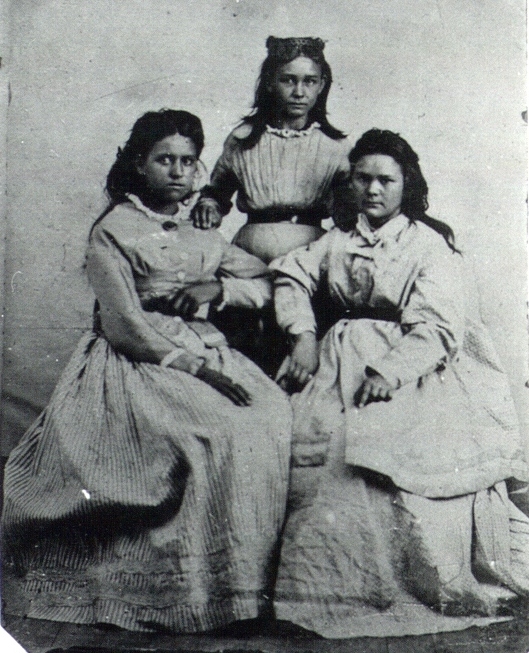 After the war, Watie served as a member of the Southern Cherokee delegation during the negotiation of the Cherokee Reconstruction Treaty of 1866. He then abandoned public life and returned to his old home along Honey Creek. He died on September 9, 1871. Source: Kenny A. Franks, The Confederacy, Macmillan Information Now Encyclopedia; photo of Stand Watie courtesy National Archives; photo of Daughters is Image #16978 in the Stand Watie Collection.